We could all use a little revitalizing now and then. The themes of the season are the return of hope, abundance, and protection, the return of the light, and a reminder to return to our spirituality and personal transformation as well. We hope that our friends across the country can find time to remember that this year. We all know, however, that despite our best intentions stress can take over. That’s why it’s so important to remember to revitalize your body and soul. Believe it or not, the right water is the first step. Despite what you might have been told, all water is not created equal. Not all water hydrates cells and supports life functions equally. Living water can easily penetrate the cells and perform its functions. Dead water, on the other hand, must be reformed and revitalized by the body before it can do its job. Doctors and researchers have determined that drinking living water improves health and longevity but drinking dead water allows cells to dehydrate. Castle Rock Water is living structured water. It’s “alive”because it is allowed to flow naturally through Mt. Shasta, picking up vital minerals along the way. The water is in a constant state of movement. It’s carefully bottled at the source and flows into each glass bottle unaltered. There is no extra purification process, no reverse osmosis, and no minerals added. When you drink Castle Rock Water, you are consuming live water that can rehydrate your cells and properly support life functions like no other water can. That’s so true because not only is Castle Rock Water living structured water, it’s also high-frequency water. Since it comes straight from nature, with no artificial ingredients or extra filtration, it retains its natural vibration and is in rhythm with the light that makes all life possible. That’s just the kind of revitalization that our bodies, and souls, need to thrive. 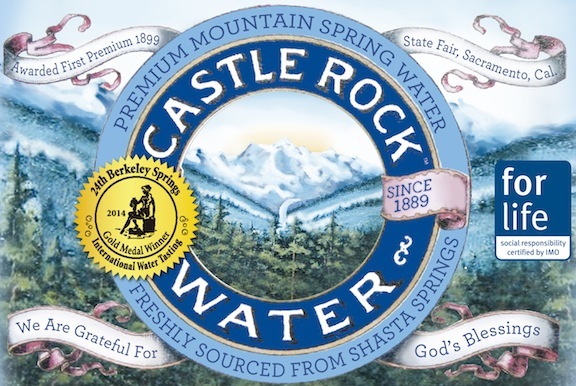 Have you tried Castle Rock Water yet?